A provocative lip duo to pleasure any pout. Offering an array of opulent shades, from notorious nudes to baroque brights and defiant darks, this iconic coordinated pairing of LUST: MatteTrance™ or LUST: LuxeTrance™ Lipstick and PermaGel Ultra Lip Pencil exceptionally enhances your lip for a look that’s flawlessly shaded and effortlessly sculpted. 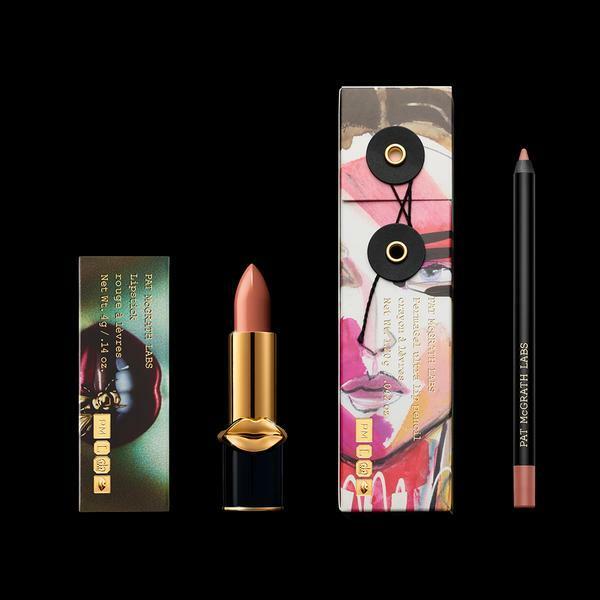 - 1 MatteTrance™ or LuxeTrance™ Lipstick 4g/.14oz, 5.7” x 1.0” x 8.9"
- 1 PermaGel Ultra Lip Pencil 1.20 g /.042 oz., 1.44” x 0.68” x 5.55"
- A harmonious duo of lip colour and pencil with innovative formulas to protect the lips while gliding and hugging every lip curve. - A single swipe of colour with flawless shading abilities. - Pigments penetrate the lips with a rich film for seamless, one-stroke coverage. - Combines powder film with saturated pigment for lightweight, longwearing, opaque coverage. - PermaGel technology, smooth application and extremely longwearing. - Blends easily and offers even colour with zero feathering or transfer. - Ultimate precision in defining, filling and shaping the lip.